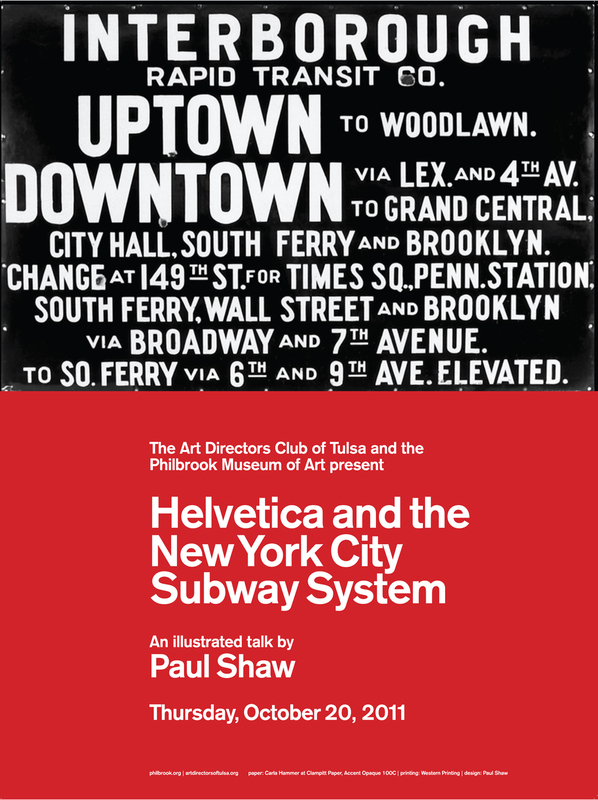 I designed this poster for my October 20, 2011 talk on Helvetica and the New York City Subway System at the Philbrook Museum of Art in Tulsa, Oklahoma co-sponsored by the Art Directors Club of Tulsa. I was trying to ﬁnd a single image that would not only sum up the basic theme of the book but also be quickly understood by a non-New York audience. In discussions with my colleague Abby Goldstein the logical approach seemed to be to show a single iconic or representative photograph of signage in the system. But how could one image encompass the book which details the competing jungle of signage that existed before Unimark International was hired to develop a modern sign system, chronicles the fate of that system, and explains why much of the pre-Unimark jungle still survives. There were many good photographs but they only told part of the story. And they required some familiarity with the subway system to be fully understood. The solution I realized was to use a single sign that would embody the chaos of the pre-Unimark subway system and use the poster itself to provide the clarity of the Unimark signage program. Thus, a comprehensive but tangled sign explaining what trains could be found at a single station is contrasted with the information about my talk laid out in a “Swiss” typographic manner—in a digital equivalent of Standard (AG Old Face) and in colors taken from the Exit signs in the 1970 New York City Transit Authority Graphics Standards Manual prepared by Massimo Vignelli.